And this is a perfect cue for the entrance of our second author, Daniel Ferreira, born in the town of San Vicente de Chucurí, department of Santander, in central Colombia. When he was six years old, Ferreira heard shots in the street, ran to the door, opened it and saw two men in uniform, perhaps guerrilla fighters but most probably members of a paramilitary group, that killed two policemen in front of the terrified child and left without noticing him. In a recent interview, Ferreira references that traumatic experience as a possible motive for his obsession with Colombia’s violence. Ever since he has wanted to know why these men had to die; and in his effort to understand that, he has been forced to grapple with the myriad atrocious complications of our history. 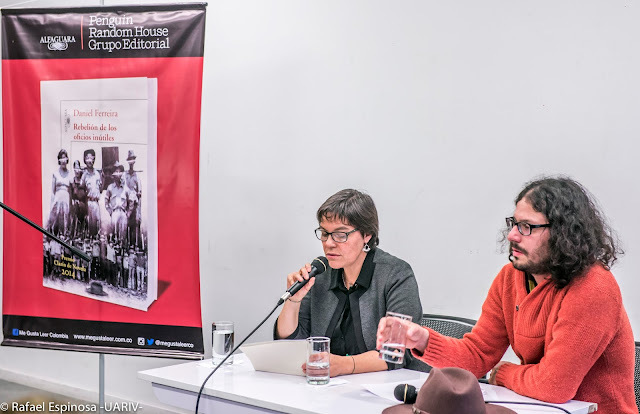 The result of that obsession is a titanic project, which he calls the Infamous Pentalogy of Colombia: Five novels, of which he has already published three, each focused on one aspect of the conflict. The third and most recently released volume of the Pentalogy is Rebelión de los oficios inútiles, or Rebellion of the useless trades; an account of the short-lived insurrection of a group of poor workers of a small Colombian town in the 1970’s, in the immediate aftermath of the presidential elections of that year, elections that left an important mark. On April 9th, 1970, conservative candidate Misael Pastrana Borrero was declared president after suspiciously defeating the immensely popular candidate of the opposition, Gustavo Rojas Pinilla. In the first official reports, Rojas was comfortably beating Pastrana; but then communications with the electoral offices were suddenly interrupted by what was later described as a ‘technical malfunction.’ When they were restored, the count was over and Pastrana was shown to have beaten Rojas by a very short margin. The results were challenged by Rojas’ supporters and examined by the Electoral Court, which confirmed the election of Mr. Pastrana on July 15th. This led, among other developments, to the creation of the M-19, one of the main Colombian guerrilla groups, active for more than two decades. So Ferreira has chosen to stage his novel in a particularly important moment of our history, and it is the beginning of this novel that I want to mention today as my second moment of delight. The book opens in a fairly straightforward way: “Esta historia comienza con…”, “this story begins with…” What follows is a purposefully dry, journalistic account of the kidnapping, and subsequent torture and murder, of Serafín Meneses Tovar, a construction worker, by members of the military forces of Colombia. The only punctuation marks between the sentences are commas; Ferreira literally does not leave you any room to breathe. And there is no pause, either, between the end of the Meneses Tovar story and the beginning of another one, which also begins with “esta historia comienza con”, “this story begins with”, and is the story of Benigno Durán, a peasant which is kidnapped by soldiers after inquiring about a friend of his who has recently disappeared; but we never learn of Durán’s fate, because his story is interrupted by yet another “esta historia comienza con”, and this new story is that of Zacarías Arrieta, an electrician who is imprisoned after a suspicious search by the police in which weapons which he had never seen before are discovered in the back of his truck. And yet again this story is interrupted by another “esta historia comienza con”, and another one follows after that, and another, and another, and another. And there is no pause between any of them. And after dozens of these stories, all of them different, all of them the same, the chapter ends without a period, or a comma, or any other punctuation mark. It’s just interrupted. Because clearly there is no end to this series of terrible beginnings, for even before a beginning gets to an end there is another beginning, and another, and all of them lead to the same dark place. And I find this beginning of Ferreira’s novel absolutely delightful. Delightful here perhaps seems like a problematic word. But allow me to explain. Readers of contemporary Latin American fiction are not total strangers to the furious beauty of total despair perfectly rendered. An illustrious antecedent of Ferreira’s masterful beginning is the third book of Roberto Bolaño’s 2666, in which the murders of dozens of poor women in Ciudad Juárez by a mysterious, bestial serial killer are detailed in a dry, journalistic style, one after the other, relentlessly, until the accumulation of names and similarities and differences and blood and knives and bullets and corpses and wounds and blood and names becomes an unbearable weight in the reader’s mind. And perhaps there is no better way to portray the dehumanizing effects of absolute violence. This is what Ferreira does in the opening pages of Rebelión de los oficios inútiles, except for the key fact that he has chosen not to finish some of his stories and not to use any punctuation; and those stylistic additions are as subtle as they are brilliant. And I find it to be a source of painful, paradoxical pleasure that a young Colombian author who, for both personal and aesthetic reasons, has been forced to grapple with the endemic violence of our society, has found such a perfect literary vehicle for his, and our, despair. Because I believe, as Dante did, and perhaps as Ferreira also does, that the acknowledgement and the exploration of hell is a necessary prerequisite for escaping it.